Dr. Kevin Young was born in Evanson, Illinois. He graduated from UNC-Chapel Hill with a BA in Chemistry in 1992. 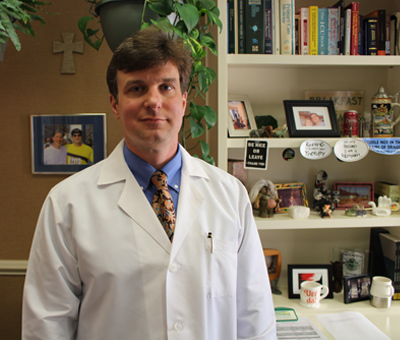 He received his MD degree from Wake Forest University School of Medicine in 1996. Dr. Young completed his internship and residency in Internal Medicine at Wright Patterson Medical Center in Dayton, Ohio from 1996-1999. From 1996-2002 Dr. Young served with the United States Air Force attaining the rank of Major. He and his wife Elizabeth have three children. He enjoys running with his border collie, Frasier.